Ever since the once-bankrupt hybrid sports car maker Fisker announced its comeback last year, the company has promised a fully-autonomous, all-electric 400-mile range sedan. We’ve seen plenty of teasers over the past few months, but now we have the final design. And it looks, well, like a Model 3. Except uglier. Henrik Fisker is a genius with a pen, having designed masterpieces like the Aston Martin DB9 and the BMW Z8. But his first few sketches for his new company’s all-electric sedan showed what looked like a hot-wheels car, and the teaser images we saw last week also looked a bit “different.” Now we’ve finally got a picture of the full car, and, well, it still isn’t quite what I’d call elegant. I get that the front end is meant to house a LIDAR system in the center, but between the lights and the vents, it all looks a bit too alien. I will say that the proportions look fantastic, though definitely familiar. From the A-pillar back, I can spot quite a few similarities to the Tesla Model 3—especially when focusing on the shapes of the side windows and the short rear overhang. To be sure, Tesla wasn’t the first to come up with these design features, but it’s hard not to look at the back of the new EMotion and think of the Model 3, which just happens to be built by the company with which Fisker is competing. The EMotion, though, isn’t meant to go head-to-head with the 3, but rather its big brother, the Model S. And to do so, Fisker’s new Jesus sedan promises lots of features, some of which definitely seem ambitious. The carbon fiber and aluminum sedan promises 400 miles of range from the “world’s highest energy battery pack,” fast charging in nine minutes (from fully depleted to 100 miles of range), fully autonomous functionality and “connected” technology. 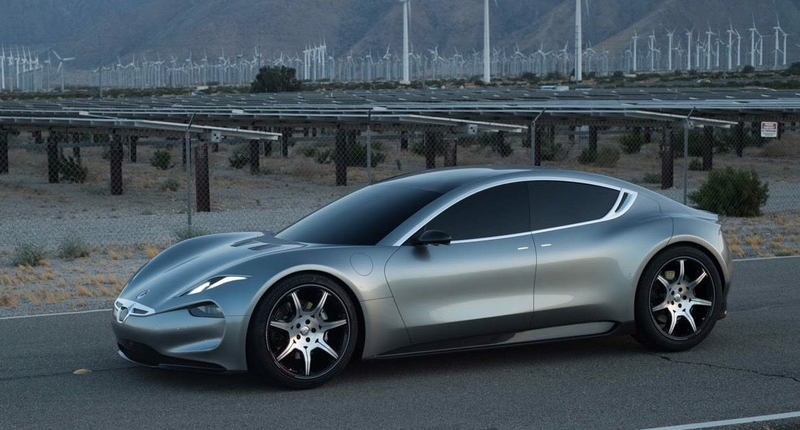 FISKER INC. WILL SPEARHEAD A REVOLUTION IN ELECTRIC CARS THAT WILL DISRUPT THE ELECTRIC VEHICLE MARKET AND CHANGE THE WORLD. Yeah, definitely ambitious. It will be exciting to see how these things turn out once production starts for the 2019 model year.